Kids grow up so fast, don’t they? First they’re wetting their diapers and blowing saliva bubbles, then all of a sudden they’re driving a car and working summer jobs. With millions of students graduating from high school and college every year, many parents might feel like time is moving at the speed of light. But of course that doesn’t mean you can’t throw one of the best graduation parties ever. It’s the perfect event to cherish fond memories and make new ones with all of your friends and family. Before your graduate travels headlong into their promising future, you’ll want to plan a graduation party that’s fun and special. To take some of the pressure away from your planning, have a look at the following 10 ideas to throw the perfect graduation party. Now that your graduate can put some letters after their name, such as MD or CPA, you can decorate the graduation party to fit their major. A wreath of pearly white cartoon teeth would suit a future dentist. Bushels of apples would be perfect for a soon-to-be school teacher. Red and blue strobe lights would be appropriate for an upcoming police officer. Has your graduate just finished high school? No worries. You can still give the party a theme that relates to what career they want to pursue in college or elsewhere. Is your graduate unsure of what they want to do in the future? That’s perfectly understandable. One solution to this would be to have neutral graduation party decorations. You can simply use items that relate to education as a whole, such as books, blackboards, pencils, diplomas, and more. When it comes to food, a cake is often the highlight of any party. A creative design could literally be the icing on the cake of your event. Nowadays, one can do just about anything with edible icing. You can even print photos of the graduate, including deliciously embarrassing baby photos, or the school name and mascot. The images are often made of buttercream icing and, when placed on top of the cake, can meld perfectly with the frosting. An artistic shape to the cake is another way to make dessert eye-catching and mouth-watering. Consider shaping your cake into a graduation cap or a stack of books. If you have a specific theme in mind, think of something that goes with it, such as an airplane shape for a pilot or a cartoon brain for a psychologist. Graduation is an emotional time for everyone, especially for the person who has just completed school. In addition to excitement, relief, and nostalgia, your graduate might be feeling a bit anxious about the future. Although feeling anxious is quite normal, this is where a book of advice can come in handy. Older friends and family members are sure to have lots of experiences they can write about. Their words of wisdom will be able to ease the graduate’s worries and guide them into the future. One idea for this project is to use a time-worn book or journal, something that Socrates could have used, for example. You can find many different kinds of vintage journals on Amazon or Etsy. After the party, your graduate can read the inspiring entries while feeling assured about the future. They can even fill in the rest of the book for themselves as they experience more of life. 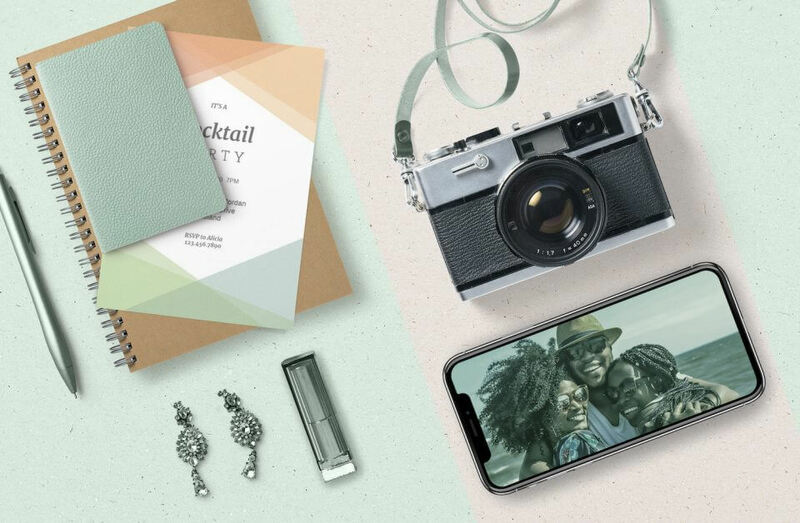 Alternatively, you could decorate the pages of a blank book with different-colored outlines of keys and the give it the title: The Keys to Success. Everyone loves some corniness. Speaking of corniness…you might remember when your graduate was just celebrating their sixth birthday with a game of pin the tail on the donkey. How time flies! Well, with a game of pin the tassel on the grad cap, all of your guests can have fun with this unique take on a nostalgic game. Using a thick, black poster board, draw a large outline of a graduation cap, then use a pair of trusty scissors to cut out the shape. To give the outline dimension, you’ll want to draw the lines of the cap. Be sure to put a white dot where the tassel should be pinned. Next, you can tie various colored strings to the heads of your pushpins. Voila! You now have plenty of tassels so that all of your guests can give the game a try. This game can also be adapted to a dartboard. Just be sure to put the game in an area that is both safe and spacious. To encourage friendly competition, you can have a prize for the person who gets closest to where the tassel should go. Why not give the winner their very own basket of delicious goodies to take home? A decorative table of pun desserts is sure to bring laughs to your sweet-toothed guests. You can arrange a colorful table featuring book gummy worms, smart cookies, class Ring Pops, Nerds, Smarties, and more. Pirouette wafers look like a rolled up diploma, so all you have to do is tie a ribbon around them to complete the picture. Such treats could also work as yummy graduation party favors for your guests to take home with them. With programs like Microsoft PowerPoint and Pholody, it’s never been easier to make entertaining slideshows. Pick all your favorite photos and home video clips then copy them into a folder so that you have them at your fingertips when you’re ready. During or after the slideshow, your guests can share their favorite memories of the graduate. Everyone will smile and laugh when hear about the graduate as a kid scribbling in a coloring book or as a teenager in love. You can also print a selection of the photos to decorate the event. Remember that a graduation party is as much about the good old days as it is about the promising future. Spice up the photobooth with props that your guests can have fun with. Consider having a paper graduation cap, a tiny diploma, random text books, and nerdy reading glasses. The crazier, the better! Has your graduate become a know-it-all? Well now you can test their smarts against everyone else’s in a fun game of trivia. There are many different kinds of trivia games on the market, from general knowledge to more specific topics. Special subjects include all-star sports, television, and different decades. You might even find a category that relates to the graduate’s future career. Better yet, you could make your own game of trivia with questions about the graduate’s past, present, and hopeful future. This would be another wonderful opportunity to reminisce with friends and family. Whether it’s a birthday, a wedding, or a graduation party, a hashtag can always be useful to you and your guests. Use the hashtag when posting photos, streaming live videos, and sharing tweets. It’s a nifty way to document not only the graduation party, but also the ceremony and all other events leading up to the celebration. That way, people who can’t attend the event can still feel like they are a part of the festivities. Your guests can post their pictures and videos of the event using your graduation party hashtag too. The more memories that are captured, the better. Encourage your guests to use the hashtag by putting it on your invitations. Since your graduate’s future is so bright, consider handing out shades with your hashtag printed on them. You can also put the hashtag on napkins, banners, balloons, and more! Don’t be afraid to get creative. A simple hashtag is easy to remember and type out. Feel free to replace the names, degrees, and years in the above examples with your own information. A clever hashtag can also be memorable in its own right. Graduation is a time for the graduate to be the center of attention and to celebrate all that they have accomplished. A table featuring all of their achievements up until now can express inspiration and nostalgia. It’s time to gather the sports trophies, spelling bee certificates, straight-A report cards, and more. Friends and family are sure to spend some time looking over the items and talking with pride about the graduate’s successes. 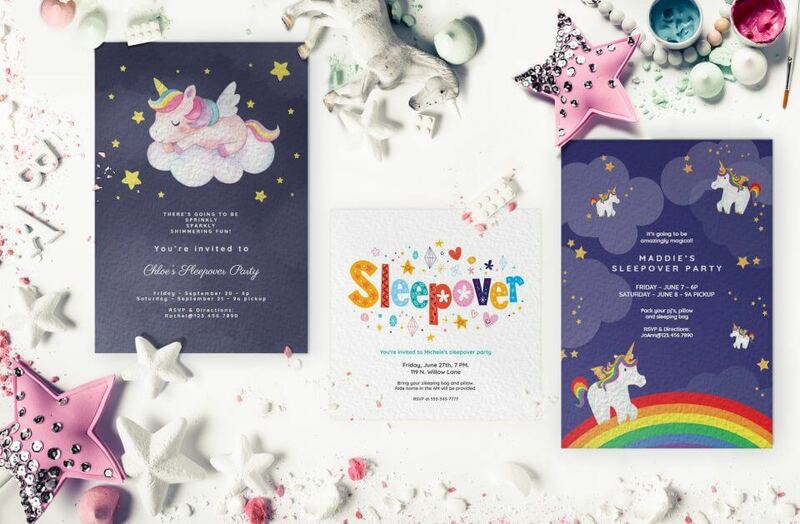 Ready to Send Out Awesome Invitations? 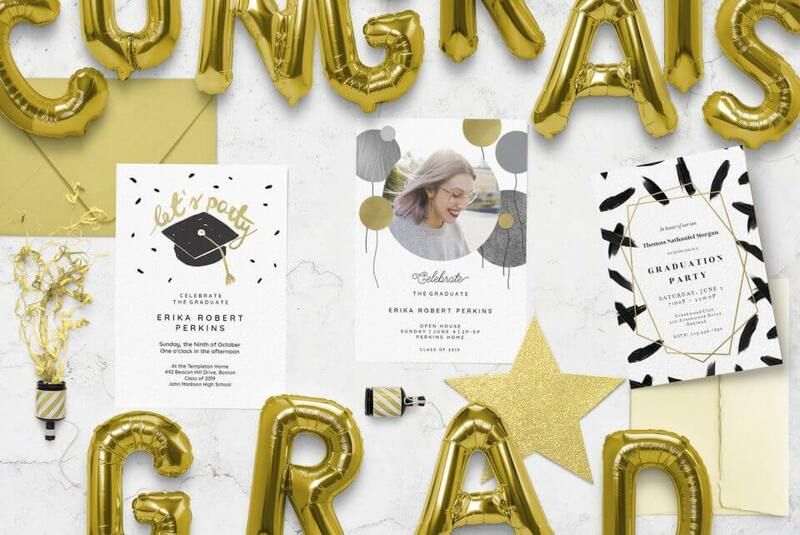 If you’re ready to start inviting your guests, look no further than the free and easily customizable graduation party invitations offered by Greetings Island. We have a wide selection of elegant and fun designs for you to choose from. Not only are they easy to customize, but you can effortlessly print them at home or at a professional print shop. If you want to keep things virtual, you have the option of sending your invitations through email with RSVP services. You can also download them as high-quality images which you can share on social media networks. Be sure to add your graduation party hashtag to the invitation so that all of your guests can contribute to the celebration.